For the first century-and-a-half of its nearly 275 year existence, the English East India Company remained ostensibly a mercantile enterprise, satisfied to simply trade, competing with other European traders. In the middle of the eighteenth century, as a response to French expansion in India, the East India Company redefined itself, becoming an active participant in India’s ‘game of thrones’. Through the use of its military might, only tentatively supported by the English Crown and Parliament, the Company dominated trade, became a king-maker, and ultimately a colonial administrator over much of the Indian Subcontinent. The Company had become a state in the guise of a merchant. The Company consolidated its position in Bengal, then began to exert its power by toppling local potentates and absorbing one princely state after another. 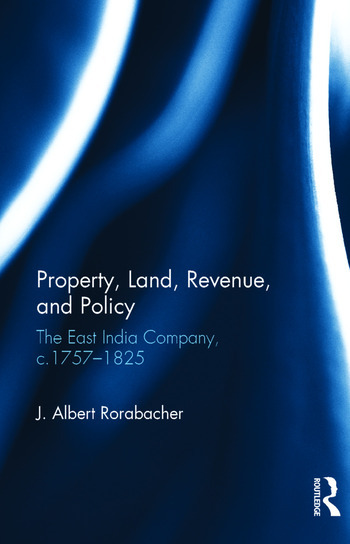 Confronted with a land system that was built on custom and tradition, and not law, with no tradition of land ownership, the British were forced to formulate a new land tenure and revenue system for India, one based on British principles of property. Permanent Settlement was the new government’s first attempt at creating a new revenue system. Through its creation, for the first time, private property rights were conferred on the formerly non-landowning zamindars. Which, as this authoritative volume notes in turn, created a land market, destabilizing the political and social structure of India irretrievably. J. Albert Rorabacher received his academic credentials from Michigan State University (B.Sc. ), The University of Texas – Austin (M.A. ), and the University of Minnesota – Minneapolis (Ph.D.). He has taught at the University of Texas – Austin, the University of Wisconsin – Green Bay, the University of Minnesota – Minneapolis, and South Dakota State University, as well as working in the private sector as a consultant.